The earliest thoughts of this project started quite a number of years ago. In fact, I began thinking about the connection of food, gardening, and people in the urban landscape as I learned about food deserts, nutrition scarcity, and the overall impacts of commercial agriculture on the environment -- both locally and globally. It wasn't until pursing a degree in environmental sustainability that I started to build a more robust interest in the topics, though. Nevertheless, this project is driven by the common goal that appears in each of project: learning more about a specific community. But more than that, it also provides an outlet to learn more about the food grown within our communities and how that binds people together. From Melvin Hazen Community Garden looking north. Located on Sedwick St. NW in Washington DC's Cleveland Park neighborhood, Melvin Hazen Community Garden features approximately 100 gardening plots on National Park's land. The garden is an original and lasting Victory Garden from World War II. A stepping-stone path that allows farmers to reach plants in the center of their plots. Purple coneflowers with bumble bees flying around collecting nectar. A wider view of the purple coneflowers placed within several tomato plants. Red acre cabbage along the floor of a gardener's plot. A watering hose connection located at the back of the garden. Water spigots are places throughout the garden for easy connection and watering. A hose connected at the center of the garden with a slow drip, keeping the neighboring plots watered. A greenhouse located at Food Roof Farm in St. Louis, Missouri. Run by Urban Harvest STL, Food Roof Farm helps to provide access to food in places where high quality food may often be scarce. Learn more about the garden here. 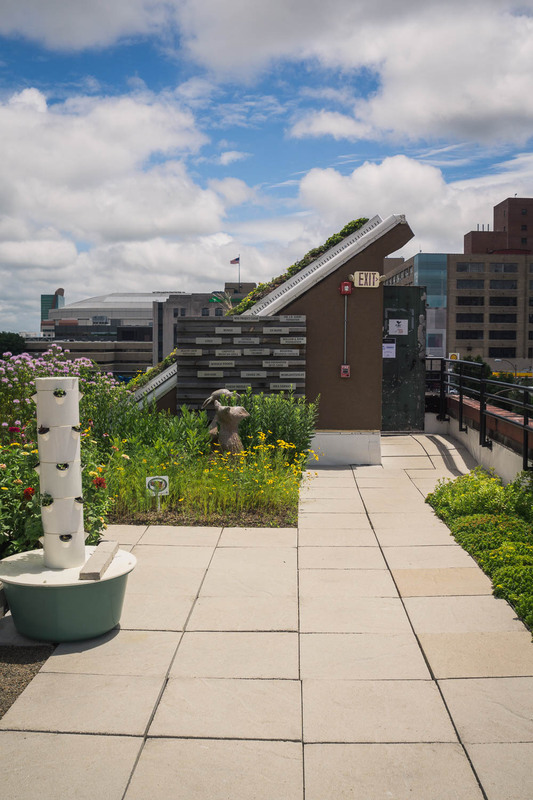 Food Roof Farm by Urban Harvest STL utilizes each square inch of the roof to harvest rainwater. Inside of the tool shed at Food Roof Farm by Urban Harvest STL. The welcome sign for Common Good City Farm, located in the LeDroit Park neighborhood of Washington D.C. The greenhouse at Common Good City Farm, located in the LeDroit Park neighborhood of Washington D.C.
A visitor to Common Good City Farm looks into the greenhouse during the Tomato Party held at the farm on August 16, 2018. 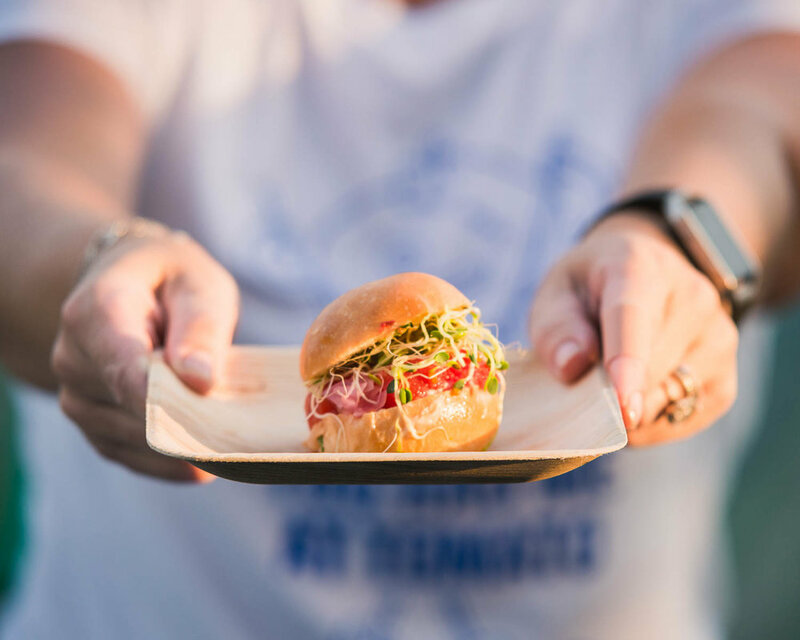 Local food company, Beefsteak, brought the signature Beefsteak Burger for visitors to try during the Tomato Party held at Common Good City Farm on August 16, 2018. The mini burgers were made with tomatos sourced from the farm. A volunteer chops into tomatoes for participants at the Tomato Party at Common Good City Farm. A volunteer displays Common Good City Farm's collection of pickles. A visitor scoops bowtie pasta onto their plate during the July 19, family dinner at Common Good City Farm in Washington, DC. A chef preparing food for the annual Common Good City Farm Night on the Farm event. A chef prepares tacos for the annual Common Good City Farm Night on the Farm event. Common Good City Farm is located close to it's neighbors within the LeDroit Park neighborhood. With produce picked every Wednesday morning, Common Good City Farm provides fresh fruits and vegetables to neighbors in the LeDroit Park neighborhood of Washington D.C.
A children's book on display during a family night at Common Good City Farm, located in the LeDroit Park neighborhood of Washington, DC's northwest quadrant. Bruschetta with locally sourced tomatoes from the Common Good City Farm. Participants gathered to try food created from the farm in LeDroit Park, located in Washington, DC. A volunteer at Common Good City Farm adds tomatoes to a salad at a family dinner on July 19, 2018. Tacos made fresh from locally grown foods for the annual Common Good City Farm Night on the Farm event.